Thornhill Galleries stocks representations of all the phases of Georgian fireplace design. With big names such as Robert Adam and Thomas Chippendale, the Georgian style period may be one of the most influential in British history. Georgian fire surrounds are exemplified by their classical inspiration, derived from a contemporary fascination with archaeology after the discovery of Pompeii. Fireplaces often featured ancient Roman or Greek inspired motifs with urns and statuary, mythical creatures and nature motifs on the jambs, frieze and mantel shelves. Georgian design was lighter and more refined than those that came before. Rather than the dark woods of the Gothic and Baroque periods, Georgian mantle pieces instead used cleaner marbles with sparser decoration. Colour tended to be muted, creating a sense of harmony rather than ostentation. Society at the time saw a greater emphasis on entertaining, and a mantelpiece would have been the focal point of a room. 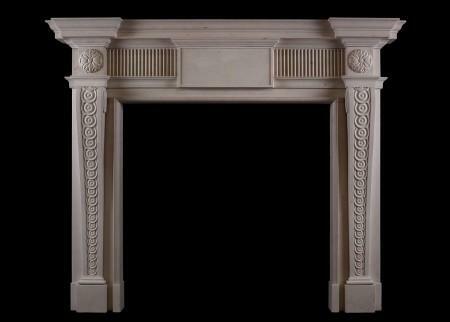 For more info on the Georgian fireplaces for sale, please see below. 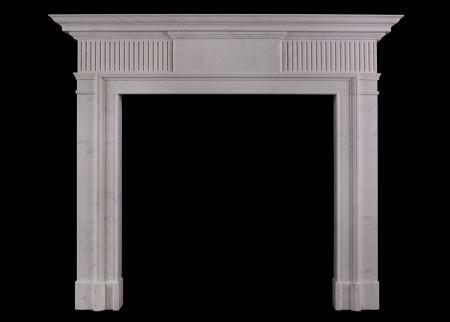 A simple white Neo-Classical marble fireplace. The fluted frieze with plan centre blocking surmounted by moulded shelf. English, modern. An English fireplace in the Georgian style. 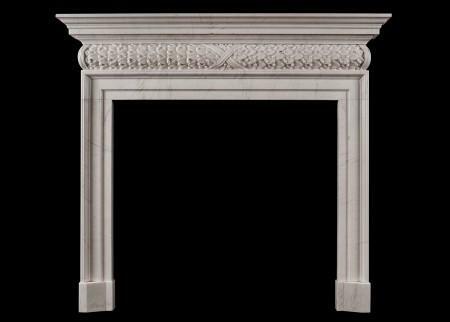 The shaped white marble jambs with inlaid Italian Sienna, surmounted by elegant carved scrolls. The plain inlaid frieze surmounted by moulded shelf above. A copy of a period original from a property in Mayfair. Good quality, antique Sienna marble. N.B. May be subject to an extended lead time, please enquire for more information. 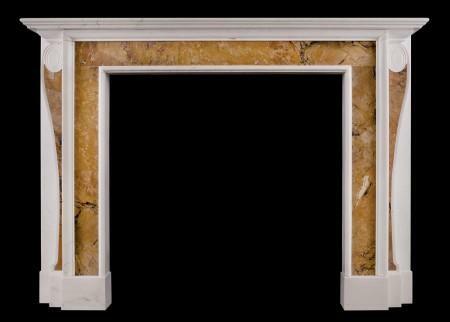 An English, Queen Anne style white marble fireplace with Italian Siena Brocatelle inlay. The richly coloured Siena providing an interesting contrast to the simplicity of the moulded design. A copy of a period piece. A well proportioned English Georgian style fireplace. The fluted frieze with carved centre block of winged staff and flamed torch, intertwined with ribbons and serpent. The end blockings of classical Grecian urns, with egg and dart cornice and leg moulding. The jambs with unusual curved fluted pilasters. Break fronted shelf. 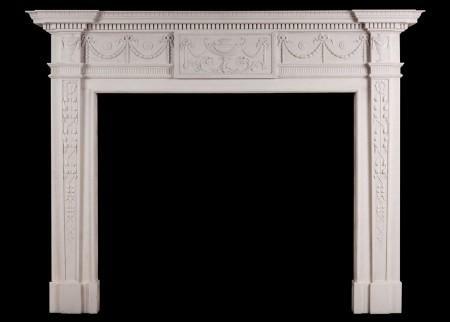 An elegant late 18th century style white marble fireplace, with fluted frieze and panelled jambs. The side blockings beautifully carved with delicate flowers. Attractive moulding beneath frieze and blockings. A copy of a period original (circa 1790 to 1800). 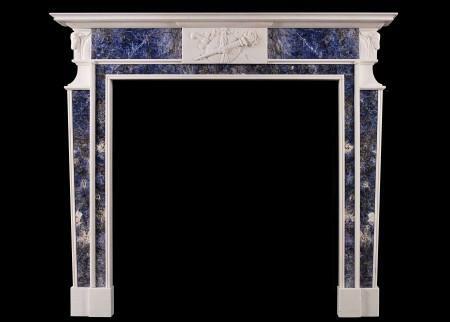 A charming late Georgian style carved white marble fireplace with striking rich blue marble inlay. The centre tablet finely carved with torch, sword, shield and ribbons. The side blocking embellished with angled rams heads and acanthus leaves. A copy of an unusual George III original. 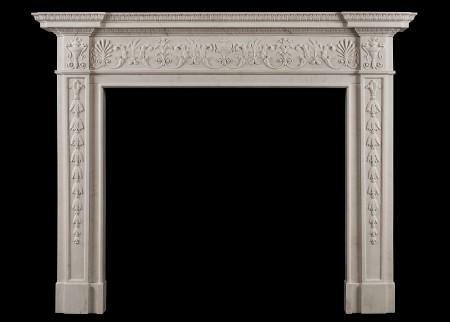 A charming late Georgian style carved Portland stone fireplace. The centre tablet finely carved with torch, sword, shield and ribbons. The side blocking embellished with angled rams heads and acanthus leaves. A copy of an unusual George III original. 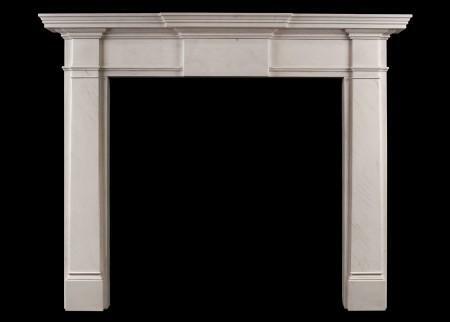 An elegant George II style fireplace in white marble. The fluted frieze centred by plain panelled tablet, the bracketed jambs carved with guilloche decoration. Moulded breakfront shelf. English, based on a period original. Modern. 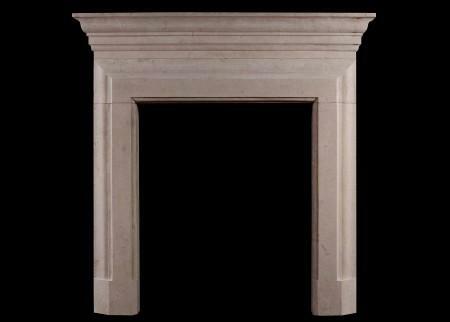 An elegant George II style fireplace in Lincoln limestone. The fluted frieze centred by plain panelled tablet, the acanthus leaf patera above bracketed jambs carved with guilloche decoration. Moulded breakfront shelf. English, a copy of a period original. A very good quality English, white marble fireplace in the late Georgian style. The frieze with carved lion masks, drapery and dentils, the jambs with delicate inner moulding of egg-and-dart and carved acanthus leaves to corners. The shelf with carved rosette pattern surmounted by matching egg-and-dart moulding. A fine copy of an earlier original. 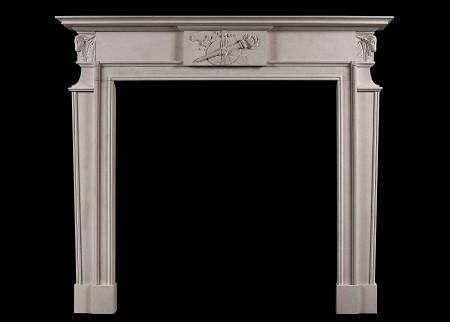 An English, Chippendale inspired white marble fireplace. The frieze (from an original drawing) of isometric design, tapering panelled jambs surmounted by panelled corner blocks. Moulded shelf. A mid Georgian style fireplace carved in white marble. Scrolled leaf motif to frieze and jambs with rope moulding, the shelf with scrolled acanthus leaves and intricate moulding above. In the Palladian style associated with architects such as Inigo Jones, Lord Burlington, William Kent and later Robert Adam. 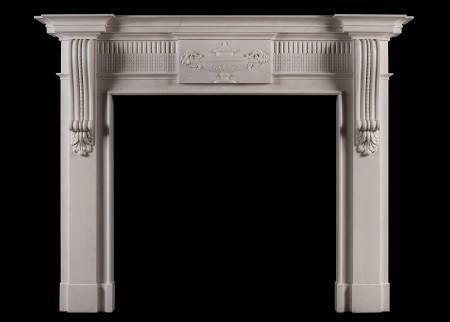 A late Georgian style fireplace carved in white marble. The jambs and frieze ornamented with a continuous band of guilloche enclosing rosettes and carved leaf mouldings. The shelf with acanthus leaf, egg and dart and dentil detailings. Based on a design by James Adam in 1766. 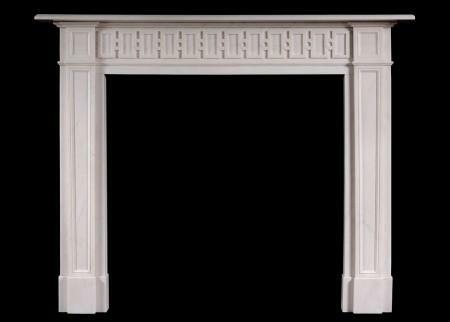 An English white marble fireplace. The frieze and jambs with carved guilloche pattern throughout, surmounted by moulded shelf with carved dentils. English, based on a late Georgian design. Modern. A fine quality English white marble fireplace in the late 18th century Robert Adam style. The frieze with carved centre block featuring urn and foliage with tied ribbons, the side panels with husks and drops connected with tied ribbons. The jambs with intertwined leaf drops and acorn top surmounted by carved urn side blockings. Waterleaf carved cornice and fluted moulding under frieze. A quality reproduction of an original piece. 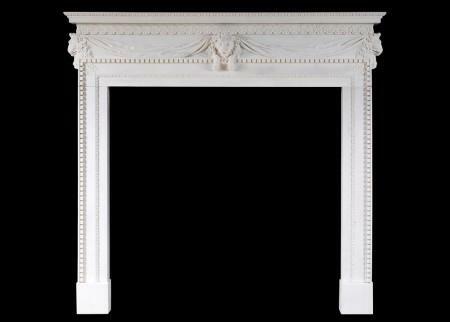 A refined and well proportioned mid Georgian style fireplace in white marble. The barrel frieze with panelled centre, and elegant moulded jambs and shelf. A copy of an 18th century design. A good quality English Georgian style fireplace in Portland stone. The barrel frieze with centre panel, surmounted by moulded shelf. A fine quality copy of a period piece. 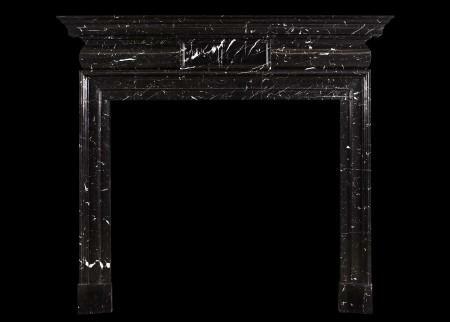 A stylish and well proportioned mid Georgian style fireplace in Nero Marquina marble. The barrel frieze with panelled centre, and elegant moulded jambs and shelf. A striking black marble with white veining. A copy of an 18th century design. 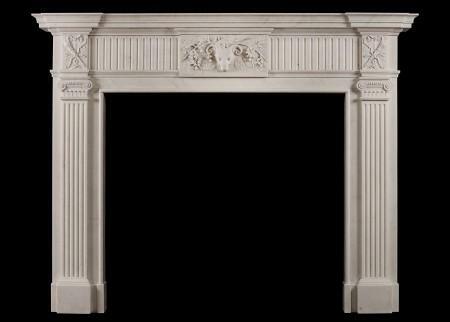 An English Georgian style fireplace in limestone. The barrel frieze with centre panel, surmounted by moulded shelf. Some light antiquing/patination effect to stone. A fine quality copy of a period piece. An elegant English George II style fireplace in Portland stone. The carved frieze with leaf motif and moulded centre panel, surmounted by moulded shelf. A fine quality copy of a period piece. 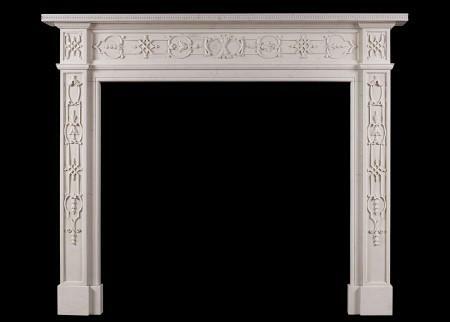 A fine mid 18th century style carved white marble fireplace. The crisp, flowing carving to the frieze and jambs is reflective of the Chinoiserie work of Thomas Chippendale (1718-1779) in the mid 18th century. A late Georgian style carved fireplace in white marble, the centre tablet with an ornate urn with stylised scrolled decoration either side, and Vitruvian scrolls around the urn, the top scrolled jambs with oval floral decoration. Moulded shelf. A copy of a late Georgian original. A finely carved late Georgian style fireplace in white marble. The jambs with well carved shaped brackets, fluted frieze with carved husks, with centre tablet of carved urn and rams heads. Breakfront moulded shelf. A fine copy of an original piece. 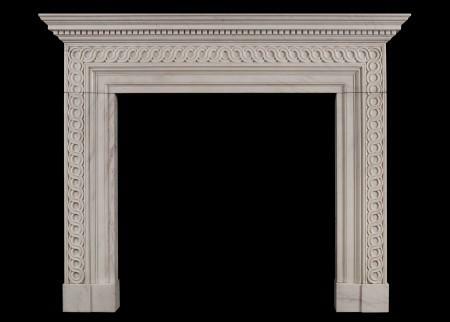 A good quality English Georgian style fireplace in white marble. The moulded shaped jambs surmounted by Greek key pattern frieze and straight moulded shelf. Copy of an early 19th century design. A fine quality English white marble fireplace in the manner of George III. The centre tablet with rams head and vine leaves, juxtaposed with inlaid fluting. The fluted jambs surmounted by ionic capitals and quiver, arrow and ribbon side blocking. Moulded breakfront shelf. A good quality copy of an original piece. 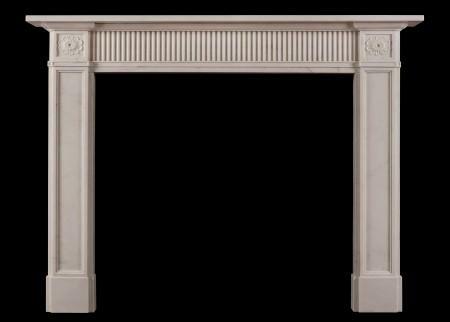 An attractive George III style white marble fireplace. 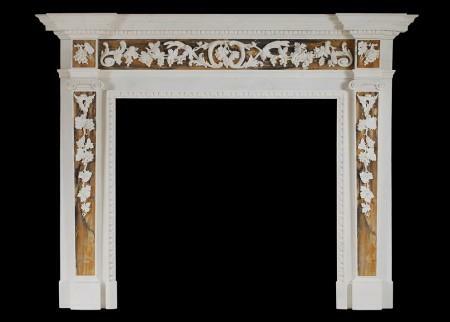 The frieze delicately carved with scrolled foliage to centre blocking and side panels. The jambs with carved tied ribbon with bellflower drops below. Based on a late 18th century original. 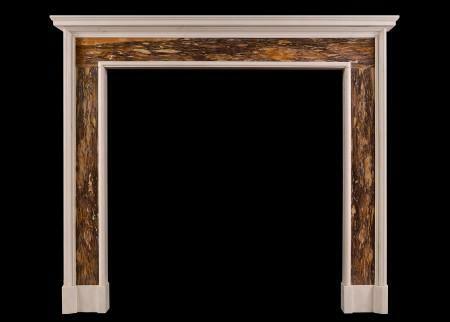 A very good quality English George II white marble fireplace with Siena inlay. 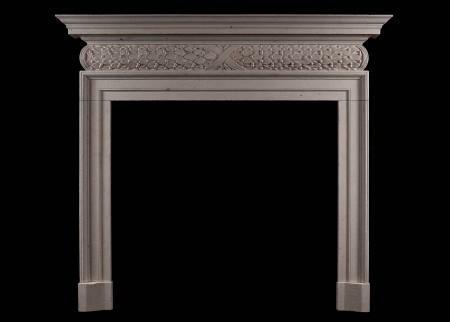 The frieze finely carved with grapes, foliage and wheat sheafs surmounted by breakfront shelf with leaf moudling. The tapering jambs with carved drops of foliage and grapes. The aperture moulding with carved egg-and-dart moulding. An exceptional copy of an 18th century original. An elegant English limestone fireplace with carved Ionic capitals to fluted, tapering jambs. The fluted frieze with carved square paterae to the side blockings. A fine copy of an earlier original. 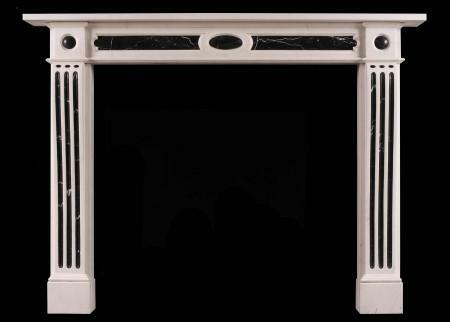 A George III style white marble fireplace, inlaid with black veined Nero Marquina. Oval panel to centre of frieze, with rectangular panels either side. The shaped fluted jambs surmounted by inlaid roundels to side blockings. A copy of a late 18th century original attributed to Henry Holland. 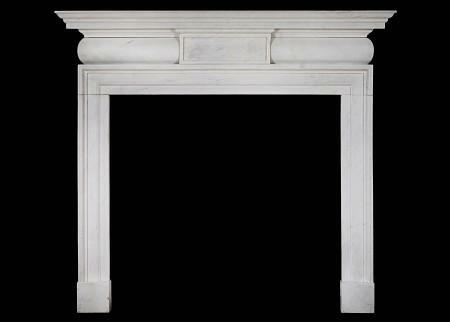 A very fine George III style white marble fireplace. The jambs with carved laurel leaves interspersed with berries inside beaded panels, surmounted by scrolled urn side blockings. The delicately carved frieze with draped urn centre, sheaths of wheat, honeysuckle, scrolls and foliage. The breakfront shelf with double stiff waterleaf mouldings. In the manner of Robert Adam, displaying the lightness, elegance and refinement typified by his interpretion of ancient classicism in a modern form. A fine copy of an original piece. 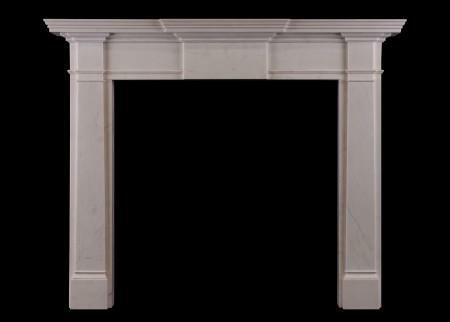 An elegant neoclassical style limestone fireplace, reflecting the designs of the late 18th century. The fluted frieze with plain centre and side blockings. The inner moulding of carved waterleaf, and the moulded shelf with egg and dart bed moulding. English, modern.